Refer to Hours of Operation. Pursuant to California Rules of Court 10.613(g), the Superior Court of California, County of Amador invites comments on new and revised local rules, forms and fees. Effective 02/25/2019, the fee to attend Traffic Violator School will increase from $52.00 to $67.00. Monday through Friday, 9:30AM to 3:00PM. You may contact us at: WebMaster. 07/01 - Court requires MISDEMEANOR PLEA FORM. 06/01 - Change in Child Custody Mediation Process. 12/09 - Court Appoints Child Support Commissioner. 11/17 - Governor Brown Appoints Renee Day to Bench. 05/08 - What to do if you owe the court money? 05/07 - Budget Baseline Plan 2014/2015. 05/07 - Baseline Budget Posting. 03/17 - New Court Executive Officer announced. 10/14 - Credit Card Payments Accepted. 09/24 - New Hours of Operation. 05/16 - Courtesy Notices no longer mailed to customers. 04/22 - The Retrieval Fee for Off-Site Records. 11/27 - Child Support Comm'/Research Attorney hired. 11/26 - Notice to Charge Copy/Certification Fees. 09/17 - Court Proposed Baseline Budget 2013-2014. 09/17 - Budget Summary for public review/comment. 06/25 - 2012-2013 Civil Grand Jury Report. Parts 1-3. 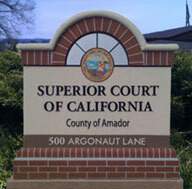 The Amador Superior Court is dedicated to serving the public by providing justice in an equal, fair, accessible, efficient, and courteous manner. The Court strives to achieve said goals by applying the law consistently and impartially to resolve disputes and by providing superb customer service to all patrons.